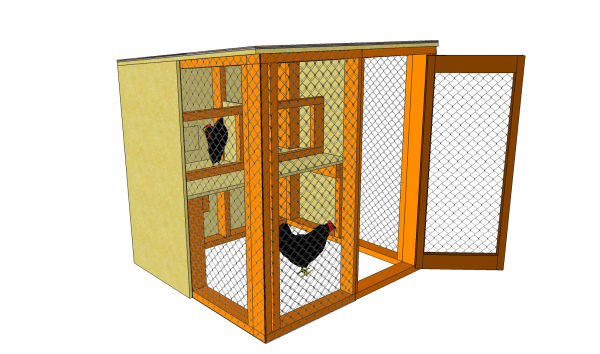 This step by step woodworking project is about simple chicken coop plans. Building a wooden chicken coop is a nice weekend project, especially if you want to protect the chickens from bad weather. Work with attention and with good judgement, as you need to plan everything from the very beginning, otherwise the coop might not be large enough for your needs. Buying the right materials is also important, if you want to get the job done as a professional. If you want to have an easy access to the nests, you could install several small doors ti the back of the chicken coop. In addition, if you want to keep the expenditures under control, you should try to use simple techniques and solutions. Align the components at both ends before driving in the screws, and pre-drill the lumber, if you want to get durable and rigid joints. 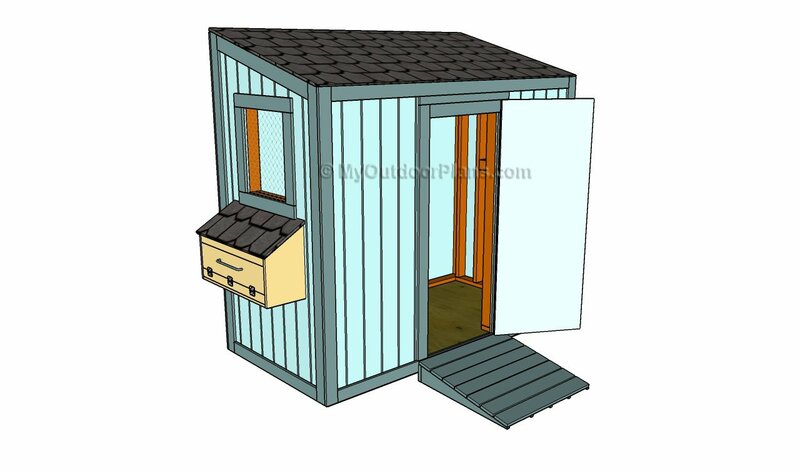 Building a chicken coop is usually a complex and expensive project, but what most of you don’t know is that you could get the job done in just a few hours and invest less than 100 dollars. 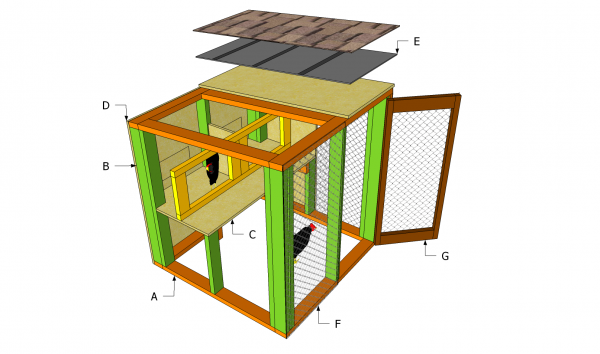 Top Tip: This project is about building a small chicken coop, so if you have or want to grow more than 10 chickens you should scale everything up of look for other plans. Building the front wall of the chicken coop is easy, as you just need to secure the 2×4 studs to the bottom and top plates. Nevertheless, before fitting the studs into place, we recommend you to cut their ends at 5º, using a good circular saw. Drill pilot holes trough the plates before inserting the 3” galvanized screws into place. Check the corners for squareness, after adding each component into place. 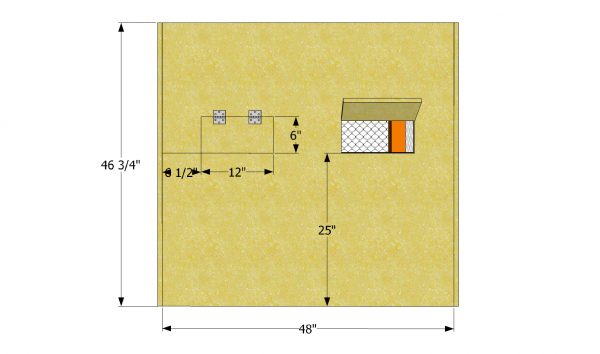 Continue the project by installing the side walls, using the free plans you can notice in the image. In order to drain the water properly, you need to create a small slope for the roof (at least 5º). Building the walls of the chicken coop is similar to building a shed, so you should get the job done by yourself. Align the components at both ends before driving in the screws, if you want to get a durable result. Building the frame of the back wall is similar to making the front wall, so you should cut the top of the studs at about 5º. Drill pilot holes trough the plates and insert the 3” galvanized wood screws into the wooden studs, by using an electrical screwdriver. Top Tip: Check the corners for squareness, after installing every components, if you want to get a professional result. After building the four wall frames, you should lock them together, as in the image. Drill pilot holes trough the end studs and insert 3” screws into the adjacent walls. In addition, plumb the walls with a spirit level before driving in the screws into place. Top Tip: Moreover, you should reinforce each joint by driving in at least 3”. Work with great care and attention, if you want to get a professional and a durable result. Next, install the brackets that will support the nest area. As you can notice in the image, you should cut the components at the right size and attach them into place. Drill pilot holes trough the components and secure them into place. 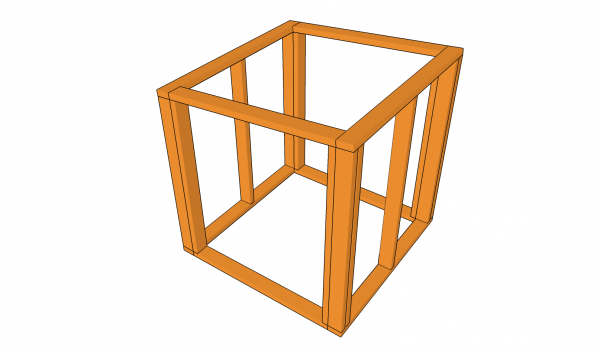 Building the nesting boxes can be done in several ways, but in this article we show a basic and efficient method. Therefore, you need to install 3/4” plywood on top of the brackets, making sure you make small notches around the studs. Top Tip: You could adjust the size of the nesting boxes according to your needs. 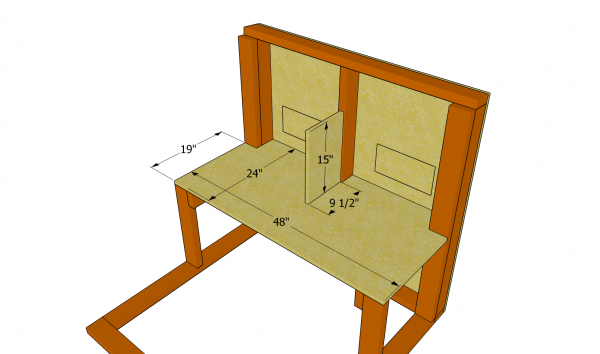 On the other hand, you could also use one side to create a large storage area. 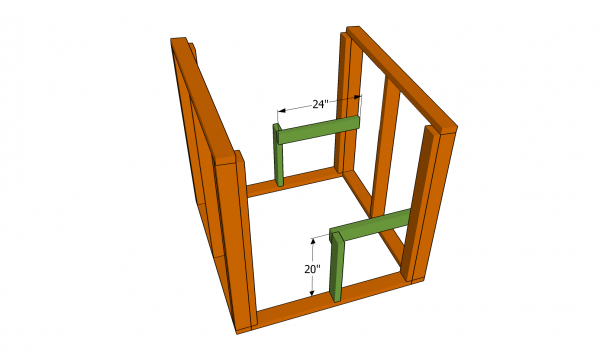 Build the frame of the nesting boxes and install it into place with 2” nails. Plumb the frame with a spirit level, before driving in the screws. Smooth the cut edges with a sanding block, otherwise the chickens might injure. 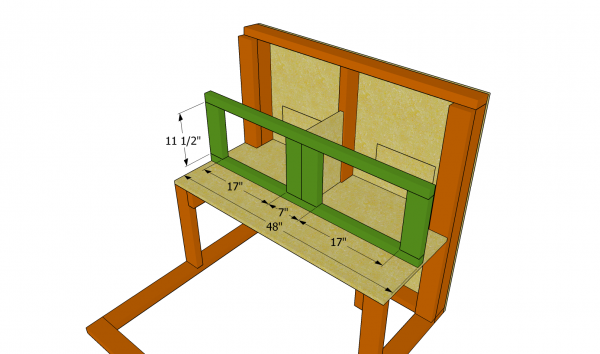 Attach the plywood to the exterior of the back wall, as in the image. As you can easily notice in the image, you could build the wall out of a 4×4 piece of 3/4” plywood. Attach the sheet to the wall frame and drive in 2” screws, every 6” along the studs. Cut out two small holes in the plywood sheet, to have an easy access to the nests, as you collect the eggs. 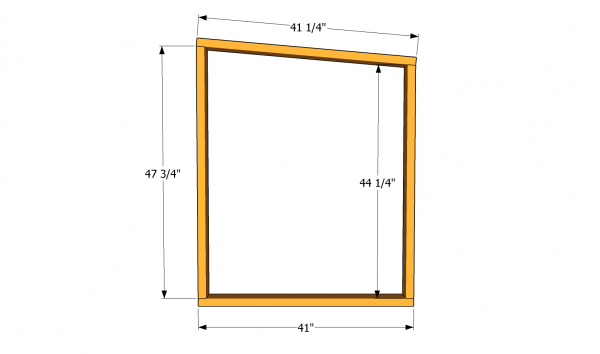 Secure the pieces of plywood to the wall with metal hinges, to protect the area from wind or bad weather. 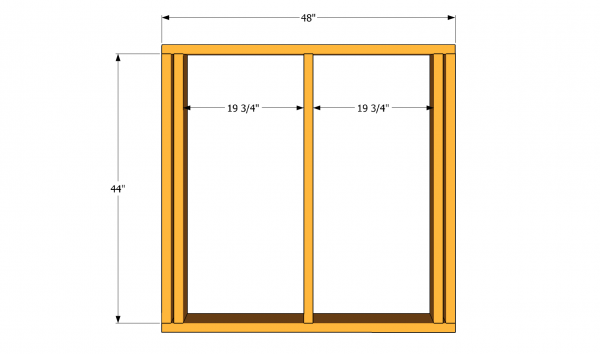 Attaching the side walls to the chicken coop will create a proper climate for the chickens. As you can easily notice in the image, you just need to cut the top of the sheet at 5º. Use a circular saw with a sharp blade to make the cuts, in order to prevent tearing the edges. This is one of the last steps of the project, so make sure you take your time and pay attention to the details. 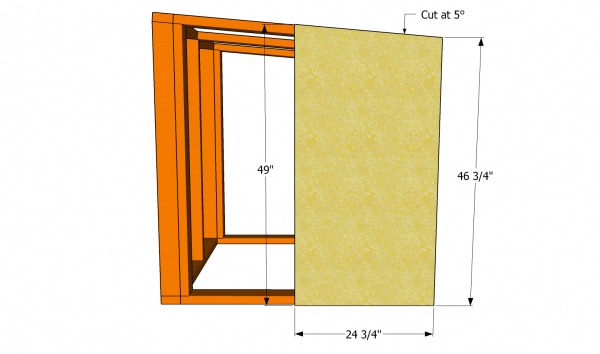 Install 3/4” plywood over the rafters of the to protect the chicken coop from bad weather. Secure the sheets into place by driving in 2” nails into the rafters, every 6”. 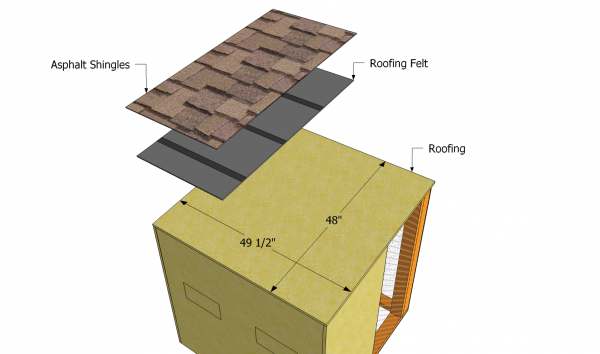 Continue the projects by covering the roofing with tar paper, making sure the strips overlap at least 2”. Next, install asphalt shingles, starting with the bottom of the roof. The shingles should overhang about 2” on all edges of the roof. Building the door of the chicken coop is a straight forward project, as you can get the job done is several minutes. As you can see in the image, the frame of the door has to be extremely light, otherwise it will move from place over time. Top Tip: Check if the corners are right-angled, before adding the chicken wire to the door frame. 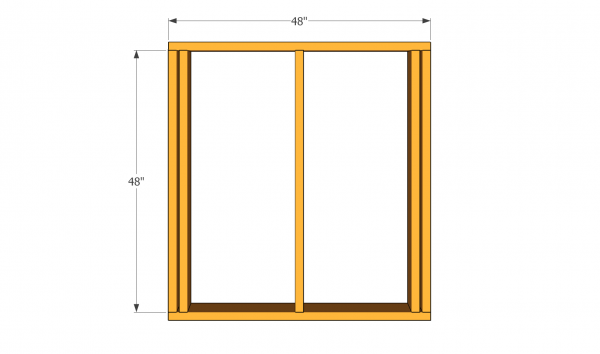 Attach the door to the frame, using a couple of metal hinges, after aligning it properly. Last but not least, you should take care of the final touches. 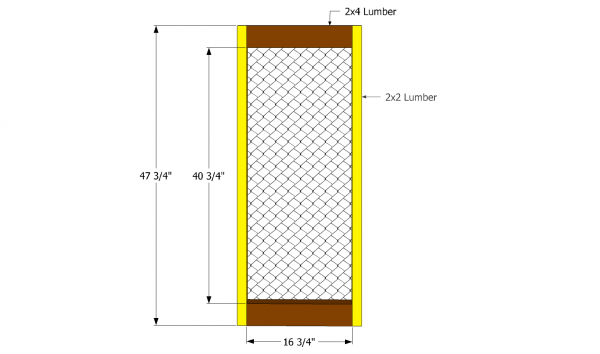 Therefore, attach chicken wire the outside of the coop and secure it into place with nails. Make sure the nails are inserted properly, otherwise the chickens could easily injure. 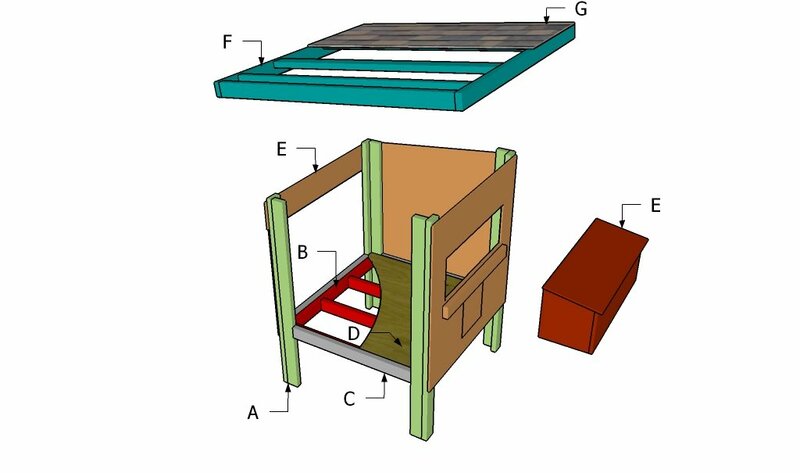 Top Tip: If you have followed the instructions and used quality materials, the chicken coop should be similar to the one in the image. This article was about chicken coop plans. If you want to see more outdoor plans, we recommend you to check out the rest of our projects. LIKE us on Facebook to be the first that gets our latest updates and submit pictures with your DIY projects.